258 Commonwealth is located on the south side of Commonwealth, between Fairfield and Gloucester, with 256 Commonwealth to the east and 260 Commonwealth to the west. 258 Commonwealth was designed by architect Samuel D. Kelley. one of two contiguous houses (258-260 Commonwealth) designed in the same style and built in 1879-1880 by brothers John W. Shapleigh and Samuel M. Shapleigh, carpenters and building contractors, for speculative sale. 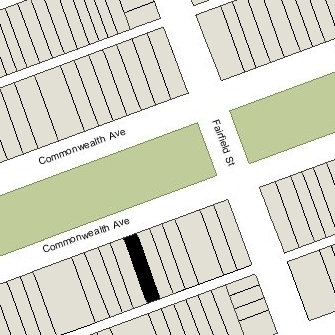 Samuel D. Kelley subsequently designed three more houses for the Shapleighs at 262-264-266 Commonwealth. John Shapleigh is shown as the owner and builder of 258 Commonwealth on the original building permit application, dated September 29, 1879. He purchased the land for the house on September 22, 1879, from George H. Braman. It had changed hands several times and was part of a parcel previously owned by Nathan Matthews, part of an even larger tract he had purchased on January 2, 1871, from David Sears, Jr., Frederick R. Sears, and Knyvet Sears. Click here for an index to the deeds for 258 Commonwealth. On June 2, 1880, 258 Commonwealth was purchased from John Shapleigh by Charles C. Poor. He and his wife, Harriet R. (Collins) Poor, made it their home. They previously had lived at 698 Tremont. On June 3, 1880, 260 Commonwealth was purchased from Samuel Shapleigh by Charles Poor’s brother, John O. Poor, and he and his wife, Abby C. (Harris) Poor, made it their home. They previously had lived at 678 Tremont. Charles and John Poor were hide and sole leather dealers in their father’s firm, Henry Poor & Son. Henry Poor had died in January of 1878. In August of 1892, Henry Poor & Son’s largest tannery, in Winn, Maine, was destroyed by fire. As a result of the loss, the firm was unable to meet its obligations and the partners (Charles Poor, his brother, John Poor, and Charles Poor’s two sons, Clarence H. Poor and Robert C. Poor) assigned the company’s and their personal assets to Edward H. Dunn, trustee for the benefit of their creditors. Among the assets they assigned to Edward Dunn were 258 Commonwealth and 260 Commonwealth. On May 26, 1893, both houses were transferred by Edward Dunn to Thomas Emerson Proctor and Nehemiah Webster Rice, both leather manufacturers, and on July 11, 1893, they transferred 258 Commonwealth back to Charles Poor and 260 Commonwealth back to John Poor. 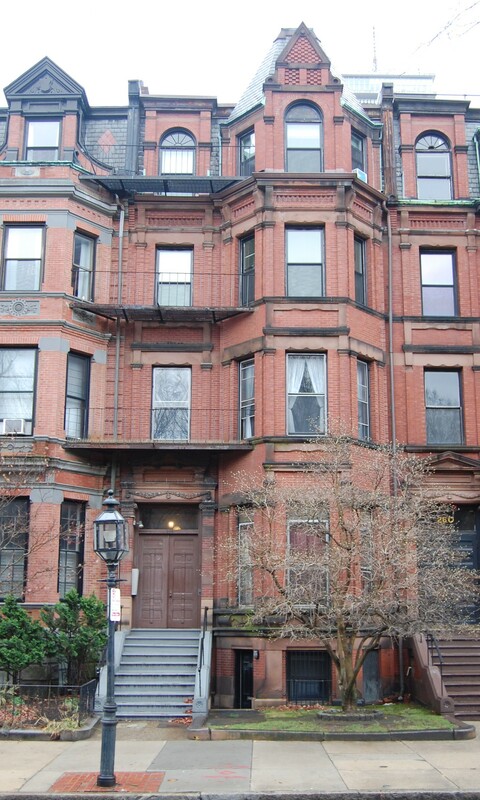 Charles and Harriet Poor continued to live at 258 Commonwealth during the 1894-1895 season, after which they moved to the Hotel Vendome, where they were living at the time of his death in October of 1897. On June 1, 1895, 258 Commonwealth was purchased from Charles Poor by wholesale dry goods merchant Samuel Johnson, Jr. He was a widower and lived at 7 Commonwealth. 258 Commonwealth became the home of his son and daughter-in-law, Arthur Stoddard Johnson and Jennie Maria (Blake) Johnson, who had married in April of 1895. Prior to their marriage, Arthur Johnson had lived at 7 Commonwealth with his father, and Jennie Blake had lived at 196 Commonwealth with her parents, George Fordyce Blake and Martha Jane (Skinner) Blake. Arthur Johnson was a trustee of his family’s estate and various other properties. Samuel Johnson, Jr., died in August of 1899, and 258 Commonwealth was inherited by Arthur Johnson. 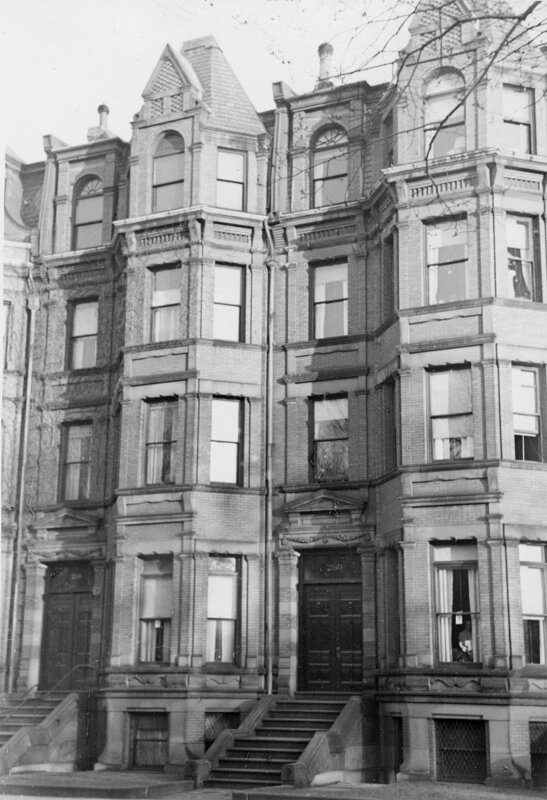 Arthur and Jennie Johnson continued to live at 258 Commonwealth during the 1904-1905 winter season, after which they moved to 253 Commonwealth. On April 25, 1905, 258 Commonwealth was purchased from Arthur Johnson by George Theodore Cruft. He was unmarried and previously had lived at 433 Shawmut. In January of 1905, he had acquired 254 Commonwealth, which he sold in April of 1905 to his sister-in-law, Florence L. (Clarke) Cruft, the widow of Charles F. Cruft. George Cruft was associated with his uncle, Isaac S. Cruft, in the management of Isaac Cruft’s real estate interests in Bethlehem, New Hampshire, and his hotel properties in the White Mountains and in Florida. George Cruft had served two terms in the New Hampshire legislature and had served as quartermaster general of New Hampshire, with the rank of Brigadier General, on the staff of Governor Natt Head. In October of 1915, George Cruft applied for (and subsequently received) permission to install a “flower conservatory” on the first floor, on top of an existing bay at the rear of the building. The conservatory was designed by architect Maurice P. Meade. Miss Carmen E. Fox, his first cousin, lived with him from about 1910; they were married in September of 1925. Carmen Fox was the daughter of Horatio Fox, the brother of George Cruft’s mother, Eunice McClellan (Fox) Cruft. George Cruft died in October of 1928. In his will, he left 258 Commonwealth in trust for the benefit of his wife, who continued to live at 258 Commonwealth until her death in March of 1947. On February 25, 1948, 258 Commonwealth was purchased from the Carmen Cruft’s trust by Susan (Susanna) M. Josephine (McNamara) Cassidy Regan, the wife of James Bernard Regan. They lived at 424 Beacon, where they operated a lodging house. On March 14, 1949, 258 Commonwealth was purchased from Susan Regan by Benigna Maria (Caponi) Whalen, the wife of Geoffrey Lionel Whalen. Geoffrey L. Whalen was an actor, writer, and theatrical producer. He began his career in amateur theatricals (winning acclaim for his impersonation of “Queen Yu May” in a Knights of Columbus show in 1907) and later was in vaudeville and in radio productions. Benigna Whalen was a singer and vocal teacher who performed and taught under her maiden name, Nina Caponi. In May of 1949, Benigna Whalen applied for (and subsequently received) permission to convert the property into three apartments, one of which became their home. Geoffrey Whalen died in October of 1949. Benigna Whalen continued to live (and offer vocal instruction) at 258 Commonwealth. Their son, Geoffrey Lionel Whalen, Jr., lived with her. By the early 1950s, the number of apartments had increased to five. Benigna Whalen died in December of 1962. Geoffrey Whalen, Jr., inherited 258 Commonwealth and continued to live in one of the apartments. By the mid-1960s, the number of units had increased to six. In addition, the Chapel of the Holy Child Jesus also was located there from about 1963 to about 1966. In April of 1968, Geoffrey Whalen filed for permission to legalize the occupancy as six apartments. He subsequently abandoned the application. On June 10, 1968, 258 Commonwealth was acquired from Geoffrey Whalen by Rudolph Guarino. On July 19, 1973, 258 Commonwealth was purchased from Rudolph Guarino by James R. Holland and his wife, Helen Devine Holland. On August 20, 1986, they converted the property into six condominium units, the Danielle Holland Condominium. 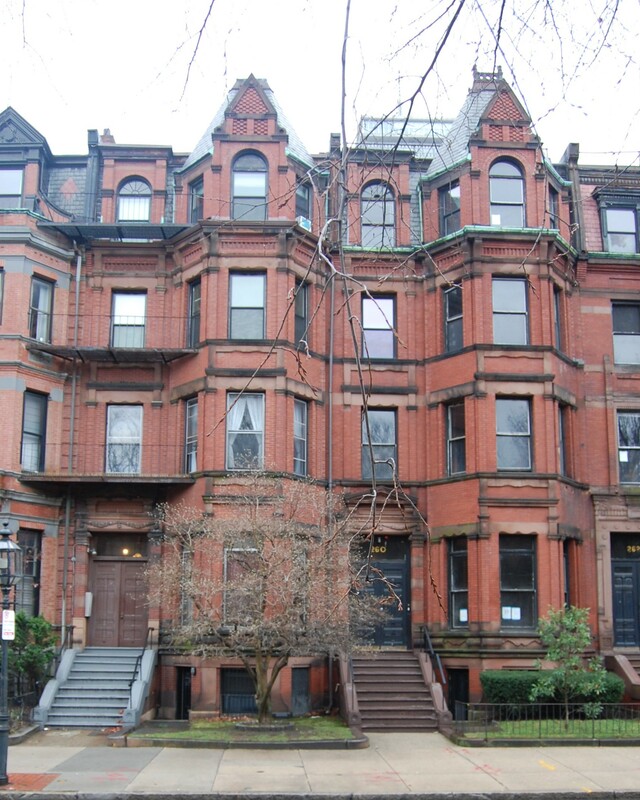 In November of 1991, the Hollands filed for (and subsequently received) permission to legalize the occupancy as six apartment, noting that the application filed in 1968 for that purpose had been abandoned.